The first time I saw this Youtube cooking demo on how to bake vegetable cake (Cake Sale) I knew that I will be making it the moment I get all the ingredients together. The cake is flavorful and has lots of nutrients in it. 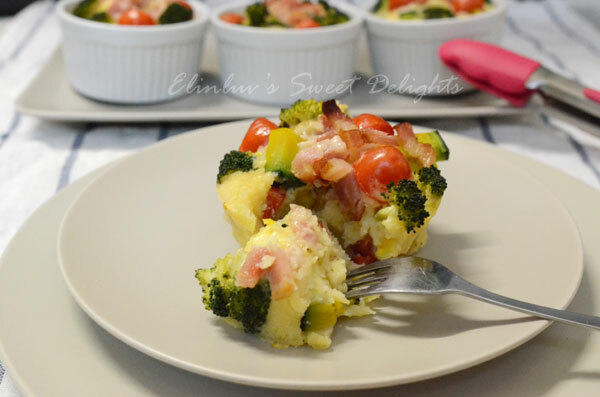 It taste quite similar to a quiche but yet different in texture. 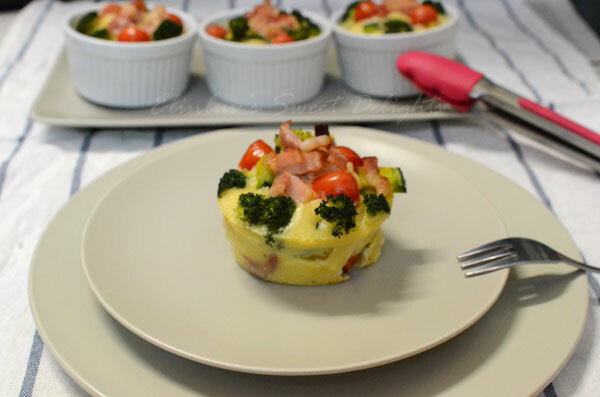 It is a little bit salty and has lots of vegetables and baked in a cupcake pan or in ramekins. Very very delicious and it can be served as a meal on its own. It is best eaten fresh from the oven and it still taste good on the next day if you cover it with a foil and warm it in the oven. 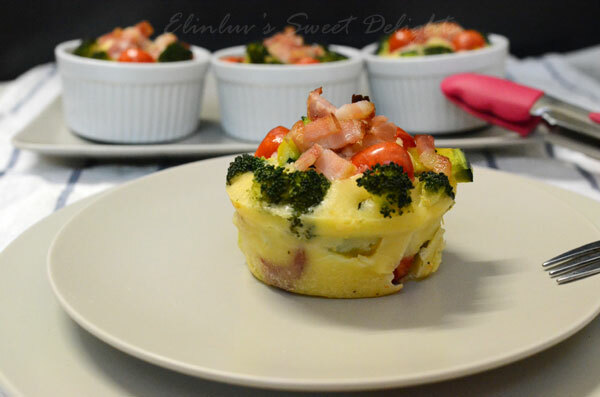 Looks impressive with its colorful topping of vegetables and bacon. Aromatic when freshly baked . 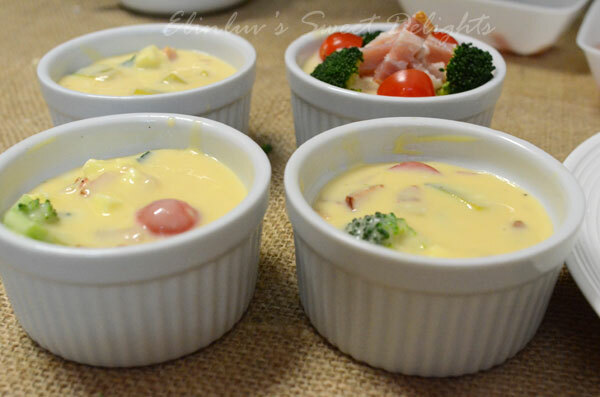 Bacon and cheese goes well together in any dish. 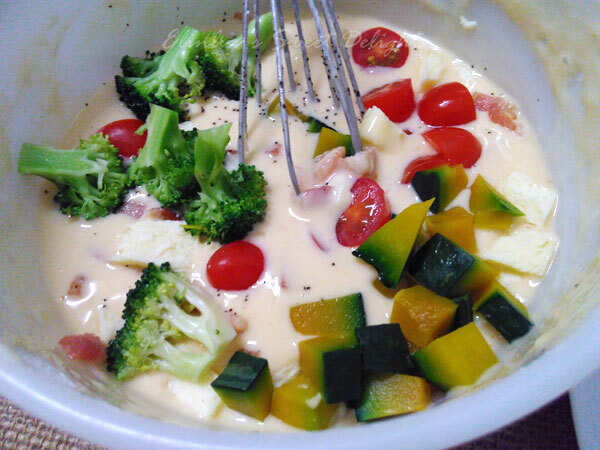 You can choose any vegetables you like and I chose cauliflower , japanese pumpkin and cherry tomatoes. You can use any cheese you like as the recipe did not mentioned any kind. I used cheddar cheese and the whole combination is really an explosion of flavors. 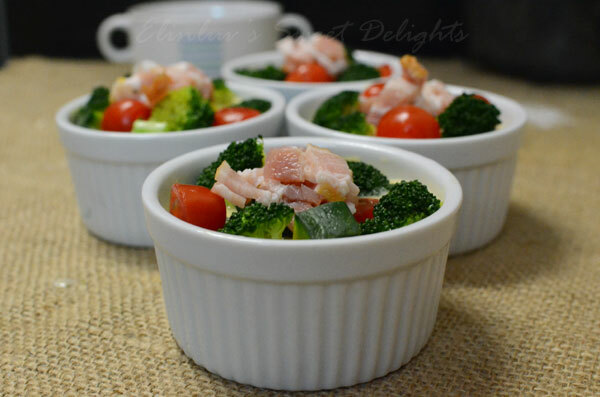 Love it and if you are serving this to your guests, I am sure they will love it and will ask for a second helping. Try it to believe me. Cut the vegitables into small pieces. 1. Boil the vegitables and cut them into small pieces. 2. Crack an egg into a bowl and beat it with a whisk. 3. Add milk, salad oil, salt and pepper and mix. 5. 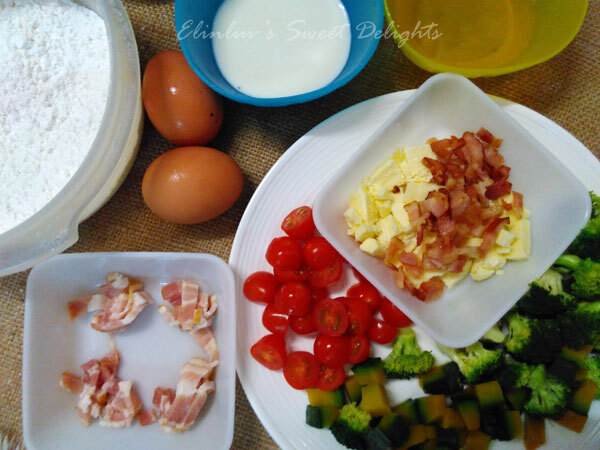 Add the vegitables and the bacon to ④ and mix lightly. 6. Pour the mixture into the pans and put on the left vegitables and bacon for topping. 7. 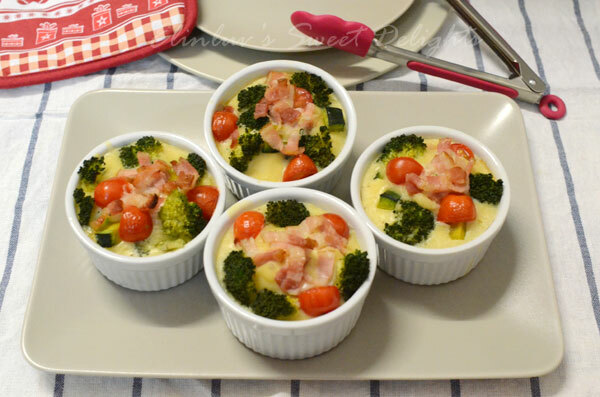 Preheat the oven at 180°C and bake them for 12~14 min and serve! You can use any vegitables you like. Cherry tomatoes and broccoli can make the cake colorful. The bacon will taste better with salt. Hi Elin, do u think this recipe can make into a 1 large cake? What mould size? Baking duration?